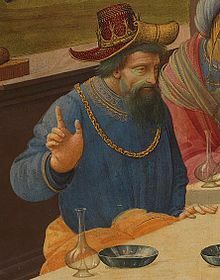 King Aeëtes by Bartolomeo di Giovanni. Aeëtes, Aeeta, or Æëtes (/iːˈiːtiːz/; Ancient Greek: Αἰήτης Aiētēs [a͜ɪ.ɛ͜ɛ́tɛ͜ɛs]) was a king of Colchis in Greek mythology. The name means "eagle" (aietos). Aeëtes was the son of sun god Helios and the Oceanid Perseis, brother of Circe, Perses and Pasiphaë, and father of Medea, Chalciope and Absyrtus. His consorts was either (1) Idyia, the youngest daughter of Oceanus, (2) Asterodeia, a Caucasian Oceanid, (3) the Nereid Neaera, (4) Clytia, (5) Ipsia or Eurylyte. According to others, he was the brother of Perses, a king of Tauris, husband of his niece Hecate, and father of Medea, Chalciope and Absyrtus. Yet other versions make Aeëtes a native of Corinth and son of Ephyra, an Oceanid, or else of a certain Antiope. Asterope was also one of the possible mothers of Aeëtes. Odys. Theo. Frag. Scyth. Sch. Oly. Arg. Sch. Fab. Sch. Arg. Pausanias states that, according to the poet Eumelos, Aeëtes was the son of Helios (from northern Peloponnesus) and brother of Aloeus. Helios divided the land he ruled, and he gave Aloeus the part in Asopia (see Asopus) and Aeëtes the part of Ephyra (Corinthos). Later, Aeëtes gave his kingdom to Bounos, a son of Hermes and Alkidameia, and went to Colchis, a country in western Caucasus. When Bounos died, Epopeus, a son of Aloeus who ruled in Asopia, became king of Ephyra too. Aeëtes built a new colony in Colchis, near the mouth of the large river Phasis, and called it Aea. Phrixus, son of Athamas and Nephele, along with his twin, Helle, were hated by their stepmother, Ino. Ino hatched a devious plot to get rid of the twins, roasting all the town's crop seeds so they would not grow. The local farmers, frightened of famine, asked a nearby oracle for assistance. Ino bribed the men sent to the oracle to lie and tell the others that the oracle required the sacrifice of Phrixus but before they were able to kill him, Phrixus and Helle were rescued by a golden ram sent by Nephele, their natural mother. Helle fell off the ram into the Hellespont (which was named after her) and died, but Phrixus survived all the way to Colchis, where Aeëtes took him in and treated him kindly, giving Phrixus his daughter Chalciope in marriage. In gratitude, Phrixus gave the king the golden fleece of the ram, which Aeëtes hung on a tree in his kingdom. Some time later, Jason arrived to claim the fleece as his own. Aeëtes promised to give it to him only if he could perform certain tasks. First, Jason had to plow a field with fire-breathing oxen that he had to yoke himself. Then, Jason sowed the teeth of a dragon into a field. The teeth sprouted into an army of warriors. Jason was quick-thinking, however, and before they attacked him, he threw a rock into the crowd. Unable to determine whence the rock had come, the soldiers attacked and killed each other. Finally, Aeëtes made Jason fight and kill the sleepless dragon that guarded the fleece. Jason then took the fleece and sailed away with Aeëtes's daughter Medea, who had fallen in love with him and had done much to help him win the fleece. Aeëtes pursued them in his own ship as they fled, but Medea distracted her father by killing and dismembering her brother, Absyrtus, and throwing pieces of his cadaver overboard. Aeëtes paused to gather the pieces of his son, and thus Jason and Medea escaped. The mythical Aeetes may have reflected a memory of a historical personage. His name recurs in historical narratives of Classical authors who claim the enduring legacy of Aeëtes in Colchis. Arrian, touring the region in the 2nd century, reports seeing sites and ruins from Aeetes' time. The 5th-century author Zosimus mentions "a palace of Aeetes" standing at the mouth of the Phasis. Local rulers are claimed to have descended from Aeëtes, such as a king of the Phasians from Xenophon's Anabasis and Saulaces, a gold-rich king of Colchis, from Pliny the Elder's Naturalis Historia. Strabo, who treated Aeetes as a historical person, writes that this was a "a local name among the Colchians". The name of Aeëtes was bore by a historical Colchian, a 6th-century nobleman in Lazica in the times of Lazic War known from Agathias's account. If naming Aeëtes as the ancestor of the Colchian rulers was not the invention of the classical authors, it is possible that the Colchian rulers regarded themselves as descendants of Aeetes. ^ Yarnall, Judith (Jan 1, 1994). Transformations of Circe: The History of an Enchantress. University of Illinois Press. p. 28. ISBN 0252063562. Retrieved 2015-06-30. ^ Pseudo-Apollodorus, Bibliotheca 1. 9. §23. ^ Apollonius Rhodius, Argonautica, 3.243–244. ^ Cicero, De Natura Deorum 3. 19. ^ Apollonius of Rhodes, 3. 241. ^ Braund, David (1994). Georgia in Antiquity: A History of Colchis and Transcaucasian Iberia, 550 BC–AD 562. Clarendon Press. pp. 11, 30, 90–91. ISBN 0198144733. ^ Lordkipanidze, Otar (1968). "Colchis in Antiquity". Archaeologia. 19: 35–41. Apollonius Rhodius. Argonautica, 3. 240–4. 131. Pausanias. Description of Greece, 2. 3. 10. Smith, William; Dictionary of Greek and Roman Biography and Mythology, London (1873). "Periphas 5."